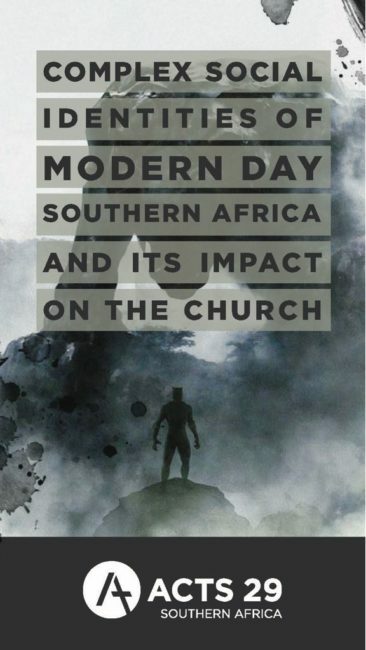 On Wednesday 11 April 2018, I spent “An Evening with Acts 29” at the New Hope School in Pretoria where a crowd gathered to explore the complex social identities of modern-day Southern Africa and their impact on the church. Until Wednesday, I had felt that I understood why the movie Black Panther was deemed such a big deal by my black brothers and sisters. It was much more than just a superhero movie. However, with the following words from guest speaker Batanayi (Bat) Manyika – “when we engage in life without hearing other’s stories, what we are effectively doing, is we are muting their existence” – I realised another level of conscious comprehension. I say ‘conscious’ comprehension because I believe that, subconsciously, we are all too aware of our tendency to be exclusive and selective about who, or what, we lend our ears to (whether we play out this tendency as individuals, communities or as a church). I loved the Black Panther movie. Wakanda (and its people) felt like a peaceful, inclusive place. It felt like a place to which I would definitely accept an invitation. As per Bat, this box office hit illustrated what unsuppressed, inclusive and empowered potential could look like. Bat went on to explain that the movie Black Panther was a watershed moment for many, especially for those whose narrative hadn’t been heard in years. As a teller of other people’s stories, I am deeply aware that I am surrounded by more compelling narratives than there are fish in the sea. If one chooses to hit the mute button on one of them, a very clear message is sent – either I do not want to be disturbed by ‘the noise’, or I’m not in the slightest bit interested in what comes next. Apply this to human interaction, and it borders on cruelty. Since Wednesday, I have been struggling to uncomplicate the layers of the evening’s topic. I’m a simple creature, but usually I manage to translate the heavy stuff into easily digestible, bite-size pieces. This time, however, I’m sitting with the depth and intricacy of the layers long after the talk and I finally conclude that I’m overthinking things. In my bid to simplify, I decided to focus on the key messages that followed me home. I really encourage you to listen to Bat’s full podcast. He has served in church leadership in the UK, Zimbabwe and South Africa. He holds degrees in theology from Wales and Stellenbosch, is employed by the South African Theological Seminary (SATS) as an academic and is currently working on a PhD in the New Testament through SATS. He now lives in France with his wife. Bat was conceived in the UK and born in Zimbabwe. He speaks many languages and has an incredibly diverse taste in food. He also reads a lot. Why am I telling you all this? Well, like you and me, Bat has a complex social identity – a concept he unwrapped a little for us last Wednesday. And just like you and me, there are many compartments to who Bat is: he is a husband, student, academic, speaker, theologian, linguist and more. We all have more than a single social identity. Our own personal narratives are not confined to what happens in our immediate space. In the past year, I have engaged with people from Malawi, Ghana, Zimbabwe, Zambia, Congo, Botswana and probably more… Last year, I was rescued by a man from Zimbabwe when my tyre burst on the highway. If he hadn’t intervened, my narrative could have changed its course. Just last Wednesday, I attended a talk by a Zimbabwean theologian. On Sundays, I attend Rooted Fellowship – a transcultural church that meets at the New Hope School in an urban suburban area of Pretoria. Our lives, irrespective of demarcated borders, will still intertwine. Beyond physical borders, there are other boundaries in place that limit or prohibit our capacity to build relationships, such as language, prejudice, preconceptions and misconceptions etc. Bat mentioned that a common criticism that is directed at Christians is that we are good at telling people what to believe but not that good at engaging. I think we often feel that others should meet us where we are rather than feeling called to take a step towards them. Why? Is it because of a fear of discomfort? Pride? Stubbornness? Shyness? Unity does not mean conformity. Unity means strength, as well as living side-by-side, in diversity. The church must be the place where we are able to discuss unsettling topics: the place to which we can bring all of our complex identities and diverse narratives while remaining focused on Christ. In South Africa, we are still coming to grips with life post-apartheid: we are still wrestling with the uncomfortable topics of racism, colonialism, crime, poverty, privilege, land redistribution and war… But tackle them, we should! My biggest take-away from last Wednesday is that our unity, or oneness, as a church should affect transformation. Affecting transformation means that we need to be intentional in our approach: “Let each of you look not only to his own interests, but also to the interests of others” (Philippians 2:4). As members of the church, the next time we ask “Who are you?”, let’s turn up the volume. Let’s more than scratch the surface; let’s enjoy the beauty of really getting to know one another’s stories. Daughter. Sister. Aunt. Friend. Adventurer. Listener. Encourager. Reader. Writer. Optimist. Working hard to stay centred on Christ, and passionate about people, places and transformation.